GUMNUTS.....AND OTHER STUFF: Four Nights on Kangaroo Island South Australia. Day 7 (last day) - 5th May. Four Nights on Kangaroo Island South Australia. Day 7 (last day) - 5th May. Now is the day that we must say goodbye. Our last day of the holiday was a wet one, well timed. We left the car and our bags at the hotel and, after breakfast at the 'Scottish Takeaway', went for a stroll down Hindley Street to look at the old buildings. After that we caught a tram from in front of the hotel to do a circular trip, first through the city to Glenelg, then back through the city to the Entertainment Centre and then return to the hotel. We then loaded the car and headed off to the airport for our the flight home. From our hotel room we could look out over the rear of the old buildings that lined Hindley Street. Hindley Street was one of the first built in Adelaide and is thus of historical significance. The rear of one of he old buildings. 'Which Bank' were we going to rob? The Princes Berkeley Hotel in Hindley Street was originally called the Black Bull Hotel. The building dates from 1878. 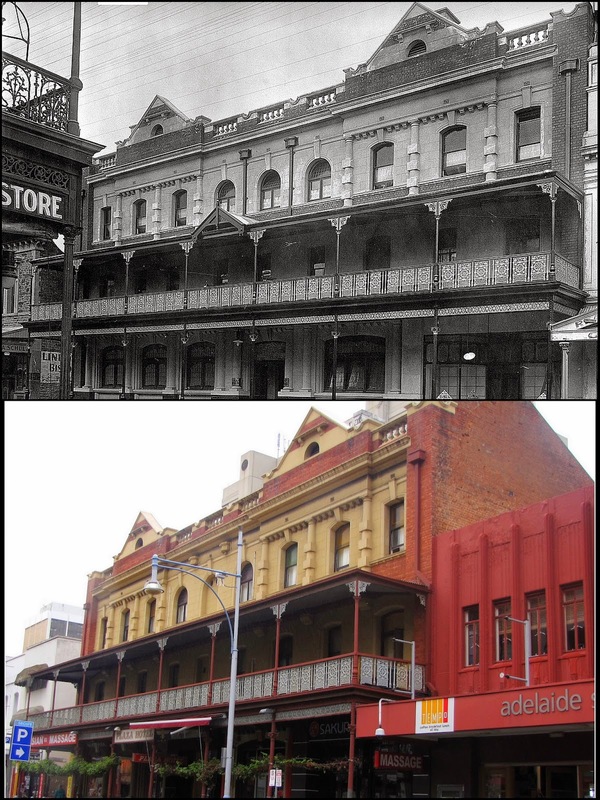 In 1880 there were 18 hotels along Hindley Street! A lot of buildings in Adelaide have the a blue and white sign 'Polites' on them. Polites was the name of Adelaide’s most successful property tycoon. Whenever he purchased a city building, Constantine George Polites would immediately erect a sign to indicate the building’s ownership. The end result was a city emblazoned with hundreds of blue and white Polites signs. In particular, Hindley Street can boast the greatest concentration of this unusual form of signage. I could find any historic notes to this building at 74-78 Hindley Street. Colourful, but what does it mean? By the 1880's a large number of Coffee Palaces were established around Australia, although they were more popular in Victoria and South Australia. These Coffee Palaces were often huge, grand and elaborately decorated buildings designed to compete with hotels. In effect they were hotels that did not serve alcohol, but provided food, drink and accommodation for their customers. This unusual building was originally constructed in 1900 and called Austral Stores but in 1908 it was leased as a Coffee Palace, becoming known as West's Coffee Palace in 1919. Grand Coffee Palace, in 1907 and present day. The Palace, providing you with the very best in sophisticated adult entertainment from the country's most stunning showgirls. It must be very hot in there as the girls don't wear a lot of clothing. A couple of Adelaide's trams. Being tourists we had to have a ride, so we went to the beach at Glenelg. Somehow, with a lot of luck I think, we didn't pay any fares. Not a nice day for the beach. We don't know why, but we had the whole place to ourselves. Glenelg Beach in Holfast Bay. I'd like to see Manly Beach empty like this. Maybe the wind blew them all away. We finally saw someone else. Time to catch the tram back to Adelaide. South Australian Medical Research and Science Centre..........or the Giant Cheese Grater. Rambo, Elvis, the Blues Brothers and friends often hang out at the Squatters Arms Hotel, Thebarton. Probably a self portrait, Thebarton. Couldn't leave Adelaide without getting some photos of some of the stone houses. Just stopped the car in a back street in Thebarton and just snapped away as I walked around the block in the rain. You will notice that they all, but one, are the same style. Just stopped the car in a back street in Thebarton and just snapped away as I walked around the block in the rain. The fellow in this photo was born in the same year as his present house was built. He can't afford to have the paint removed from the stone-work and be restored like many of the others. Newmarket Hotel, corner of North Terrace and West Terrace, Adelaide. We are now heading for the airport. The sun shines on Glenelg now that we are leaving. I got a bit of a surprise when this plane crossed under, not that far below, us. So this is where they grow cauliflowers. The sun chased us home. Botany Bay, a different view than that of Captain Cook.